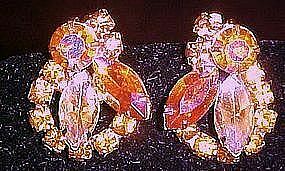 Pretty pair of vintage rhinestone earrings with various shaped stones and colors of pink. The largest aurora stones reflect lots of yellow along with the pink and are very sparkly. Clip backs and are unsigned. Ther is some bubbling and small amount of flaking on the back, which does not affect the appearance. Measures 1 1/8" x 7/8".